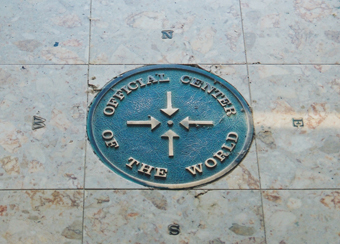 The Center of the World is not New York City, home of the United Nations and a hub of world finances. And it’s not Washington DC, where political power brokers make decisions that affect individuals globally. And it’s not Jerusalem, where important landmarks from many of the world’s major religions reside. children’s book entitled “Coe the Good Dragon at the Center of the World.” He became mayor of the town he founded, outfitted it with a number of spectacular displays, and had it legally certified the official Center of the World. Istel still lives in the town (which he named after his wife), promoting it as the center of the world and selling perfume (also named after his wife) to supplement his income. Well, Felicity has gone above and beyond in their efforts to be the actual Center of the World. First and foremost, they’ve got a pyramid! 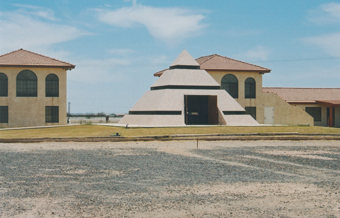 Inside the pyramid is a plaque proclaiming the town the Center of the World. Visitors are encouraged to stand in this spot and make a wish. They are then granted documentation certifying that they have stood at the center of the world, signed by Mayor Istel himself. In 1985, the pyramid was legally recognized as the Center of the World, after the sixth printing of Istel’s childrens’ book. In 1989, the French Government recognized the site as well. The town also features a flight of stairs formerly part of the Eiffel Tower, a checkerboard/field of flower combinations, a sundial featuring a facsimile of Michealangelo’s “Arm of God” sculpture, and a several other strange roadside attractions and sculptures. Among these are a number of granite blocks placed in the desert. The most interesting of these is the “Wall for the Ages,” which is engraved with the names of people who have visited Felicity. Other similar walls are engraved with the story of the birth of aviation, the history of the Foreign Legion, and a number of other notable tales. Make no mistake––the Center of the World is not fast paced, full of wealth, or a seat of international power. No, the Center of the World is instead in the middle of a sleepy desert, is home to only a handful of people, and is just about as far removed from the center of worldly activity as one town can get.